I got an email from a dead man today. His name was Bobby Ray Stewart and he was known to his friends as “HI-WAY,” a rapper and a member of the Outcast Motorcycle Club in Columbus, GA. I began my email exchange with him in January 2014, five months after I had stumbled upon the Outcast MC building. It’s located on a road that feels like it’s on the outskirts of a border town. Sort of desolate, industrial, lined with body shops and empty warehouse buildings, and hemmed in on one side by graffitied freight cars loitering on train tracks. Except it’s not on the outskirts of town. It’s smack dab in the middle of South Columbus, pretty near Fort Benning, and not too far from “Uptown,” the city’s crown jewel of revitalization. When we first saw the Outcast building, my friend and I zoomed by so fast that I didn’t take any photos and I didn’t write down where it was, but I remember that feeling of “What the hell was that? ?” It stuck in my head so strongly that I became obsessed with finding it again and learning the story behind it. I asked some locals if they knew anything about it and that was when I first learned that most people “don’t go to South Columbus.” We tried finding it again by driving the roads on the Google map that ran alongside train tracks in that area. We ended up in some pretty sketchy places. The roads there split and double back and spiral into one another. They seem to be all scrambled up. And a lot of times it feels like you literally and figuratively cannot escape from certain neighborhoods. I don’t know if that’s on purpose. It’s these types of “adventures” that probably contributed to the reason why that friend is now an ex-friend. Eventually we found the club though. It’s on Andrews Road between Cusseta (right before it divides into Lumpkin) and Buena Vista (right before it splinters into St. Mary’s). No one was ever there though when we drove past, not that we would have tried to go in uninvited. 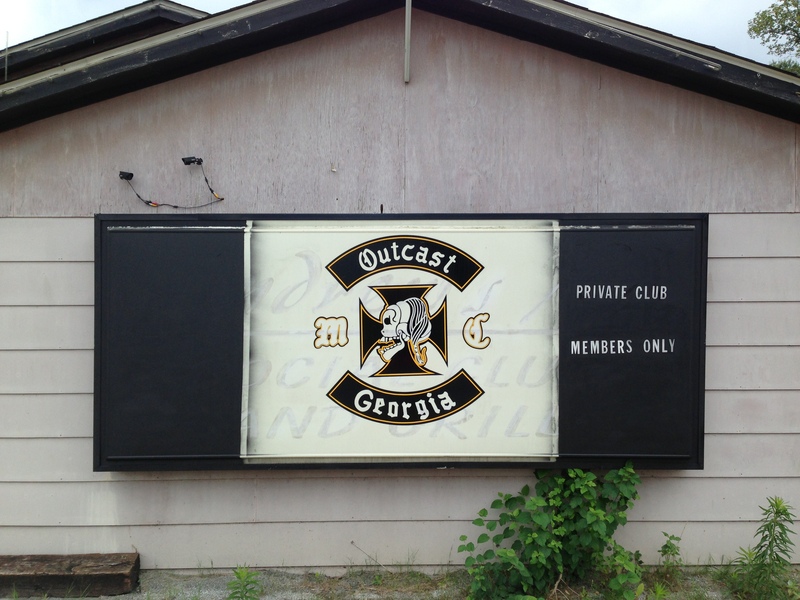 It’s clearly marked “members only.” And unlike the nearby Iron Cross Motorcycle Club on Clover Lane, there is no phone number listed for Outcast. In December of that year the various motorcycle clubs in Columbus gathered in the parking lot of the Civic Center for their annual toy run. There was a huge turnout – black and white, young and old, all with colors flying, representing their respective clubs – and truckloads of toys collected. I had not read very many nice things about Outcast on the Internet so I was curious when I saw a few members at the toy drive and that’s what really prompted me to email HI-WAY seeking more info and hoping to find something I could use to pitch a story somewhere. When I emailed him, I had just returned to New York for a funeral and I explained that I’d be back down in a few weeks. What I didn’t know was that my time in Columbus was over. He emailed me a few months later, at the end of April 2014, to check in but I didn’t answer until July, still unclear about when I’d be back. He was killed on August 24, 2014 in a shooting at a nightclub.